Clay Aiken – Life Is Not Good For Kenny! Yes…That was the night that Clay Aiken starred as Kenny, the cafeteria worker, who liked to pick hair out of the meatloaf. But life is not good for Kenny. There are rumors of job lay offs at Sacred Heart Hospital and Kenny is afraid he will lose his job because he is one of the last hired at the hospital. Originally broadcast on February 15, 2005, this particular episode received a great deal of publicity. The very popular Clay Aiken was a guest on the show and the director was using a new concept for filming the show. The director chose to use multiple cameras instead of the usual one camera for this episode. It was also the only time the show filmed in front of a live audience. 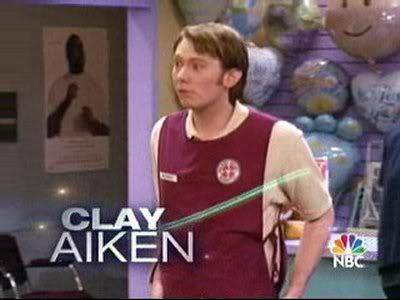 Clay played the role of a nerdy cafeteria worker named Kenny. Although Kenny is a hard worker, he is about to lose his job because of budget troubles and cutbacks. However, before he leaves he wins the hospital talent contest. Clay performed the Stevie Wonder hit, Isn’t She Lovely on the talent show. The publicity came from all different sources. The following are a few of the articles that were written about the show. 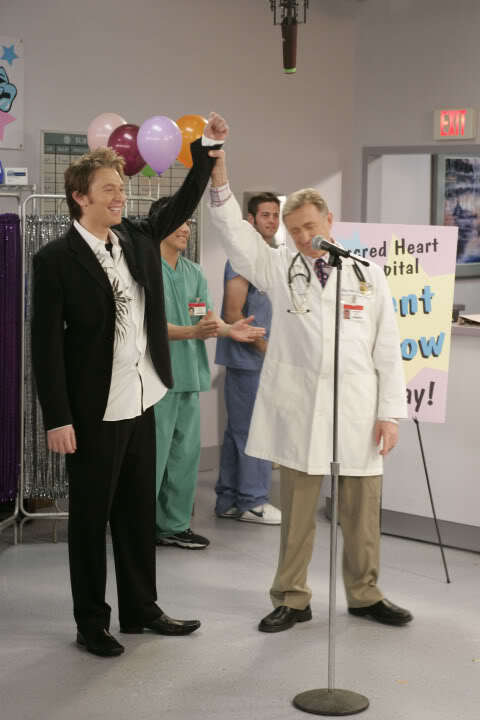 Americal Idol runner-up Clay Aiken will guest on a part-live audience taping of NBC comedy SCRUBS, usually a single-camera, closed-set show. The episode (Feb 15, 9pm ET) will poke fun at traditional sitcoms by portraying them as an unrealistic fantasy world with a laugh track. 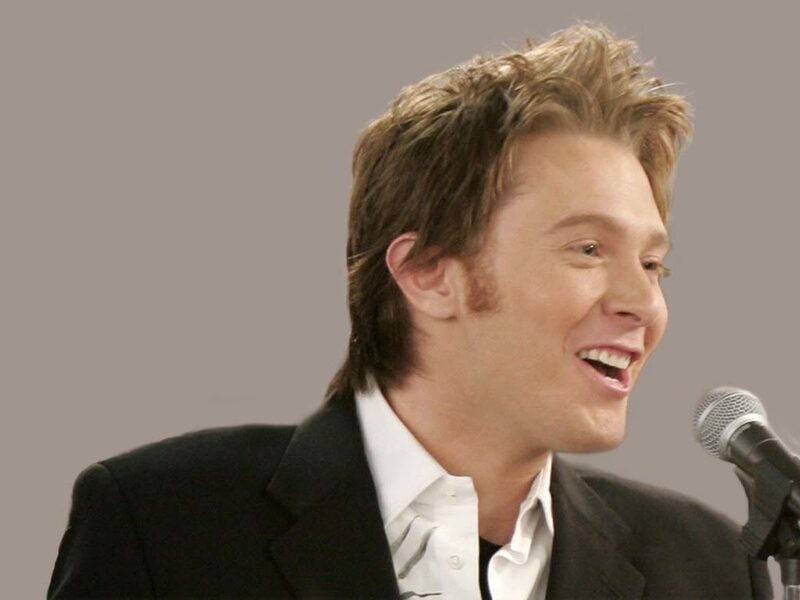 Clay Aiken will guest-star on ”Scrubs.” ”American Idol” runner-up to appear on episode that makes fun of sitcoms by Michael Slezak. Apparently, Will & Grace isn’t the only NBC sitcom relying on singing sensations to boost its ratings. 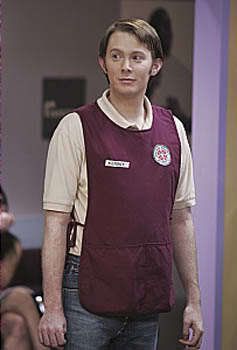 American Idol’s Season 2 runner-up Clay Aiken will play a cafeteria worker named Kenny in the Feb. 15 episode of Scrubs, which is titled ”My Life in Four Cameras,” and will reportedly ridicule such standard sitcom conventions as the laugh track, an NBC spokesperson confirmed.While Scrubs is typically filmed on a closed set, Aiken’s episode will be taped in part before a live audience. No word on whether the carrot-topped crooner will break into song during his Scrubs stint. 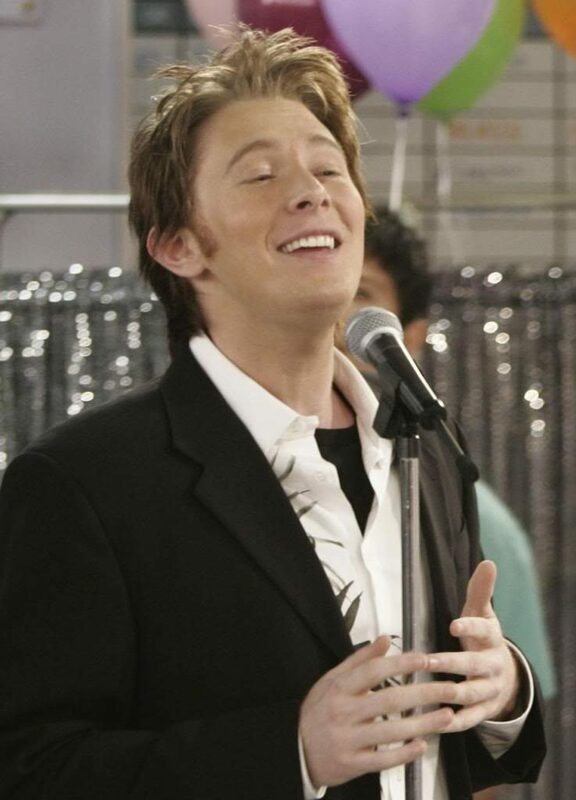 As an “American Idol” alum, Clay Aiken knows what it’s like to perform with a lot at stake, and next week fans will see him sing like his job’s on the line – his job as a cafeteria worker. Aiken stars as Kenny, a cafeteria employee who likes to pick hair out of the meatloaf. Like many episodes of “Scrubs,” “My Life in Four Cameras” centers on daydreaming doctor J.D., played by Zach Braff, and this one features the “longest fantasy sequence of all time,” taking over the entire second act, according to co-star Sarah Chalke (who plays Elliott). It starts when J.D. has to give a sitcom writer the bad news that he only has a few weeks to live, and then he wonders how the lives of everyone at Sacred Heart Hospital would turn out if left in the hands of the writer. J.D. says to himself, “Sometimes, I think we all wish life was like a sitcom,” and then suddenly, life is a sitcom, as the show transforms into a mockup of traditional sitcoms, down to its own structure. Where “Scrubs” is normally shot with only one camera and no studio audience, there are now four cameras and a live audience. Their responses surprise J.D. at first, making him wonder just where the laughter is coming from. It wasn’t easy for the cast members to adjust — learning to hold for laughs, for one thing — but they liked the energy of doing the show live for a change. “But the crew is a little over our jokes after four years,” Braff said. “And the audience laughing at our jokes makes us think for a second that we’re actually funny. Did you see this episode back in 2005? If so, you were not alone as it was one of the highest rated episodes that season. Whether you saw it before, or if you missed it, you can see it here. Just click on the YouTube and be ready to laugh out loud. I had forgotten all about Clay being on Scrubs back in 2005. I did record it at the time and enjoyed seeing it again. Clay has come so far in the last 12 years. Love going back and watching these over again!!! Thanks Musicfan! I love Clay as "Kenny, with his acting skills as a nerdy cafeteria worker and of course his singing one of my favorite songs! Thank you, CANN for posting a wonderful Claymemory! I left a longer message about 20 minutes ago but it’s gone. If I submit twice I get chastized – “you already said that!” – but if I just do it once, it often disappears. ? Hi Kathy…I always enjoy your comments and I thank you for sending them. The problem with the comments…I will try and find out what is happening. I am the one who has to approve the comments and I can't even remember the last time I didn't approve one. But…sometimes I am not home and it takes a few hours for me to approve the comments. I have the rule for approval just to make sure we don't get any crazies who say horrible things. I want CANN to be a happy, positive place. Again, I will check it out to see if I can find any wayward comments! Error: Error validating access token: Session has expired on Tuesday, 21-Aug-18 16:13:01 PDT. The current time is Tuesday, 23-Apr-19 17:33:31 PDT.